Choosing an air conditioning unit for a home can present a challenge when it comes to comparing different brands. Two brands of air conditioning units sold in North America are Trane and Lennox. Both companies have been in business for a number of years; both have a committed customer base. A good air conditioner will make the summer months more tolerable. Both Trane and Lennox offer a wide selection of air conditioning units. Trane offers 11 residential air conditioning units. Six of those units are Energy Star rated. The units range from 13 SEER to the more-efficient 20 SEER. Lennox offers eight units in three categories--the Dave Lennox Signature Collection, Elite Series and the Merit Series. Of these eight units, two are not Energy Star rated, and those two units are found in the Merit Series. The Lennox units range from 14 SEER to 205 SEER The seasonal energy efficiency ratio (SEER) rating was developed by the federal government to indicate in a standardized way the efficiency of cooling equipment. 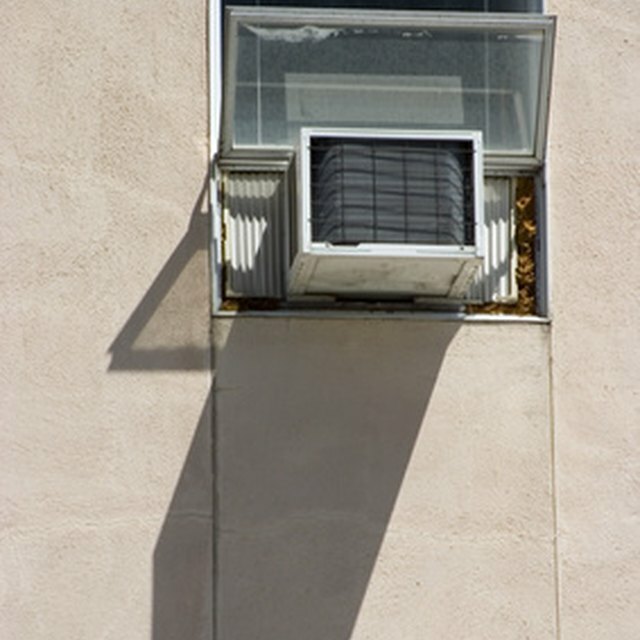 Two types of air conditioning units are available. The packaged unit (sometimes called a dual-pack) houses both an air conditioner and heater in one unit, which is installed outside the home. Trane manufactures one residential packaged unit with a 14 SEER rating. Lennox manufactures nine packaged units, with the three units in the Signature Collection being Energy Star rated. These units have SEER ratings, ranging from 13 to 15. Trane offers a limited warranty on air conditioning units, as long as online registration is completed within 60 days. Registration can be completed online or by telephone. The warranty covers any parts from manufacturer defects for 10 years. The compressor and outside coil are also covered for 10 years, and if one or both of those parts fails because of manufacturer defects, Trane will replace the part. Transportation, refrigerant and labor costs are not included A warranty from Lennox comes standard on all air conditioner units, with the units in the Signature Collection having a 10-year warranty on parts, 10-year warranty on the compressor and a limited lifetime or 20-year warranty on the heat exchanger. The Elite Series warrants parts for five years, the compressor for 10 years and the heat exchanger for either 20 years or a limited lifetime. The Merit Series warranty is five years for parts, five years for the compressor and 20 years for the heat exchanger. Trane offers an extended warranty. This program can be purchased in five- or 10-year increments and is only available for Trane units. The unit has to be less than five years old for initial enrollment. The program allows the owner to purchase coverage for part only or parts and labor. If the home in which the unit is installed is sold, the warranty is fully transferable to the new owner The Complete Care Plus extended service plan offered by Lennox covers any brand air conditioner unit after the standard manufactured warranty expires. Lennox also offers a traditional extended warranty to supplement the basic warranty. This can extend the warranty five to 10 years on any Elite and Merit Series air conditioning units. Trane was founded in 1913. Trane boasts units on such famous buildings as The Kremlin in Moscow, Russia, The Statue of Liberty, Sea World Orlando in Florida and the International Airport in Bangkok, Thailand Lennox was founded in 1895 by Dave Lennox. It has more than 6,000 authorized dealers. Lennox has the benefit of having most of its products carry the Good Housekeeping Seal. This seal is awarded by the Good Housekeeping Research Institute. The seal gives the purchaser a two-year limited warranty, in addition to the Lennox warranty. Karrie Bunting has a Bachelor of Arts in child development. She was a public school teacher for three years and also worked as an early childhood education program designer and consultant. Bunting is now studying law at Northwestern California University School of Law.